After late-night labor talks in Germany between powerful unions and industrial manufacturers failed to reach an accord, the country’s largest trade union has announced a series of rolling 24-hour strikes, expected to slow production amid an upsurge in the economy. 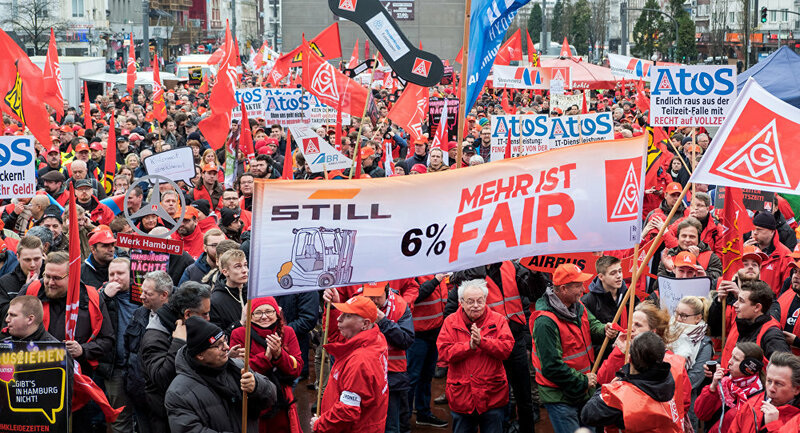 IG Metall, Germany's most influential union, announced all-day walkouts by workers in multiple industrial facilities beginning next week, including in the automobile, car parts and heavy machinery sectors. "We have to step up the pressure on employers in the coming days so that they show some willingness to compromise," stated IG Metall head Joerg Hofmann during a Saturday news conference, cited by Reuters. Hofmann added that while the unions were open to resuming talks during the nationwide walkouts, no plans would be made for new negotiations until corporations offered concessions. It what would be a blow to German manufacturing, extended strikes are also in the works should the 24-hour walkouts offer no resolution, as just under a million workers took part in brief walkouts earlier this month in support of demands for increased pay and the right to choose shorter working hours, according to Reuters. German employers declared the 24-hour strikes to be a serious risk to corporate financial health. "Twenty-four hour strikes would indeed be painful," asserted a BMW spokesman prior to the recent failed talks, as extended walkouts would disrupt the manufacture of not only the popular automobiles but also of the thousands of parts supplied by companies for their construction. BMW's Munich factory stated on Wednesday that at least 250 cars were not assembled on time, while Volkswagen-owned Audi noted that at least 700 cars were not manufactured in time to meet this week's orders, after two work stoppages at company facilities in Ingolstadt and Neckarsulm. The sharpest rise in German economic growth in six years, alongside record low unemployment figures, prompted the unions to request an eight-percent pay rise for an approximately four million engineering and metal workers. The union also requested workers be offered the choice to reduce weekly working hours from 35 to 28, to care for elderly and sick relatives as well as children, and the option to return to full time employment after a two year period.